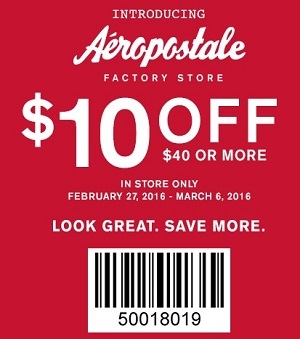 Get your printable coupon, visit any Aéropostale store location in the United States and enjoy extra savings. Take $10 off your purchase od $40 or more. The coupon must be printed to receive the offer! Source of the information is Aéropostale. For more details about the printable coupon visit your nearest Aéropostale store location or Aéropostale official website. The offer expires 03/06/2016.